Algae technique used to produce candidate vaccine that prevents transmission of the malaria parasite from host to mosquito. To do this, Vinetz and team wanted to produce a large quantity of properly folded Pfs25, a protein found on the surface of the malaria parasite’s reproductive cells, which are only present within the mosquito’s gut after it feeds on a malaria-infected blood meal. Since antibodies against Pfs25 can halt the parasite’s lifecycle in the mosquito, they might also block transmission of the parasite to the next host. However, properly folded Pfs25 that induces transmission-blocking antibodies has been difficult to produce in the lab. To overcome this problem, researchers turned to an algae better known for its ability to produce sustainable biofuels. They introduced the Pfs25 gene into the algae by shooting the DNA into the plant cell’s nucleus. Then, after they let the algae do the work of replicating, building and folding the protein, the team was able to purify enough functional Pfs25 for laboratory testing. Besides its effectiveness as a protein producer, algae is an advantageous tool for developing vaccines because it’s cheap, easy and environmentally friendly. The only requirement is simple chemical nutrients to feed the algae, which can be grown in plastic bags and easily scaled up to produce large quantities of desired proteins. Vinetz and collaborators at the Infectious Disease Research Institute in Seattle also tested several new adjuvants, molecules that help stimulate the immune system’s response to Pfs25. The best Pfs25/adjuvant combination elicited a uniquely robust antibody response in mice with high affinity and avidity — antibodies that specifically and strongly reacted with the malaria parasite’s reproductive cells. Mosquitos were fed malaria parasites in the presence of control serum or immune serum collected from mice vaccinated with algae-produced Pfs25 in the presence of the new adjuvant. Eight days later, the researchers examined the mosquitos’ guts for the presence of the malaria parasite. 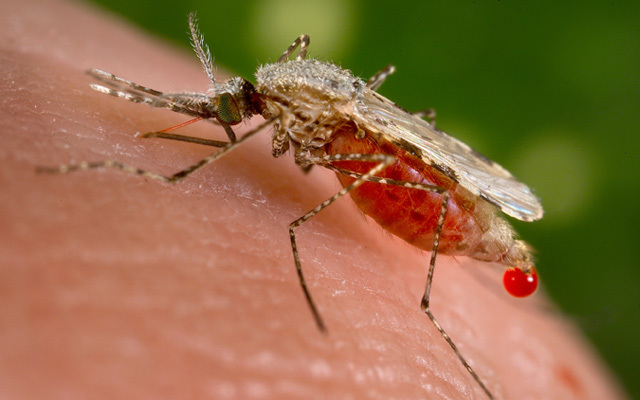 The results were dramatic: only one of 24 mosquitos (4.2 percent) that consumed the Pfs25/adjuvant-treated mouse serum was positive for the malaria parasite. That’s compared to the 28 infected mosquitoes out of the 40 in the control group (70 percent). Malaria is the leading cause of death and disease in many developing countries. In 2012, there were approximately 207 million cases of malaria infection worldwide. Young children and pregnant women are most affected by the disease. Co-authors of this study also include Kailash P. Patra, Fengwu Li, Sheyenne Baga, UC San Diego; Darrick Carter, Steven G. Reed, Infectious Disease Research Institute; and James A. Gregory, formerly at UC San Diego Division of Biological Sciences, currently at Icahn School of Medicine at Mount Sinai. This research was funded, in part, by the National Institutes of Health (grants U19AI089681, 1R01AI067727, K24AI068903, D43TW007120 and P30NS047101), U.S. Public Health Service, U.S. Department of Energy, San Diego Foundation, California Energy Commission and Bill and Melinda Gates Foundation.